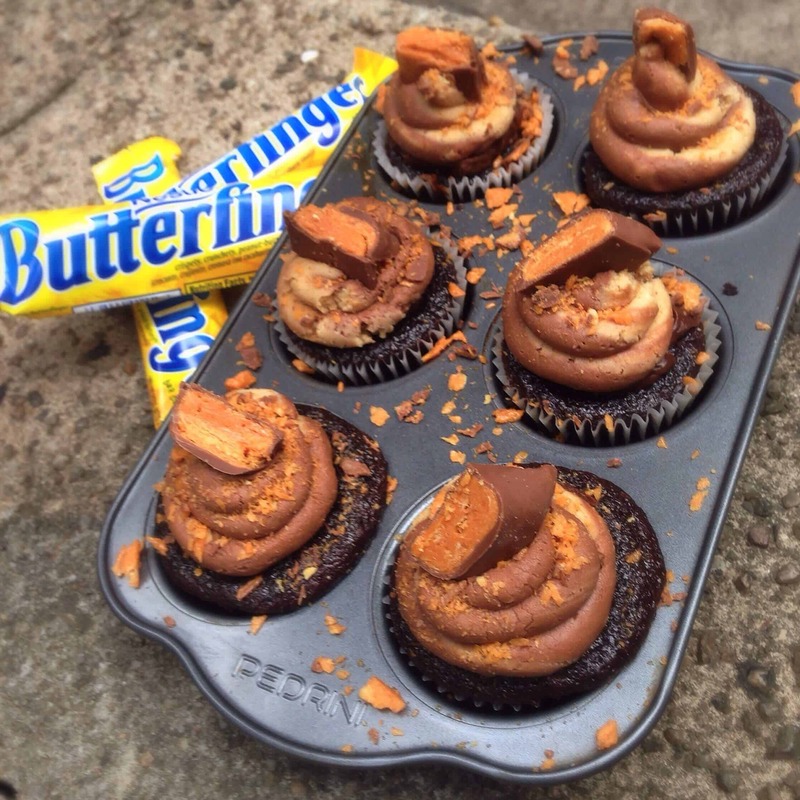 First it was the Milky Way Cake, then the Snickers Cake.…and now it’s butterfinger cupcakes!! Why? Because I love candy bars almost as much as I love cupcakes 😀 And who doesn’t love the classic combination of peanut butter and chocolate?! For the ganache, bring the cream to a boil. Pour it over the chopped chocolate, and let this sit for a minute. Add salt, and stir mixture for another minute, until fully incorporated. Let this cool and thicken, as you prepare the frosting. While the cupcakes cool, whip together the peanut butter and chocolate buttercream. Cream the butter and peanut butter, until fluffy (about 2 minutes). Slowly add in the powdered sugar, and continue mixing until well blended. Add in the salt, vanilla, and half of the heavy cream. Reserve 1/2 of the frosting in a separate bowl, and add unsweetened cocoa. Blend on low-speed, and add additional cream until you reach the desired consistency. Beat at high-speed until frosting is smooth and fluffy, about 3 minutes.